Access Profiles, Inc.: Individual Assessments ~ What They Are & Why You Need to Use Them in Your Small Business! 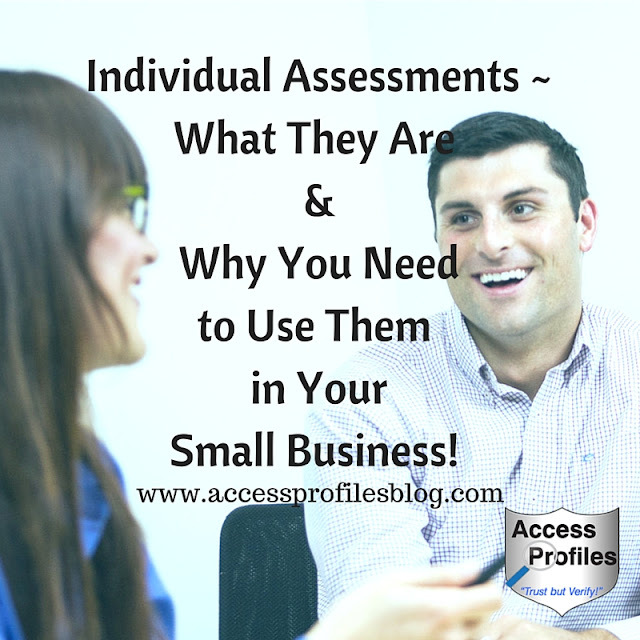 Individual Assessments ~ What They Are & Why You Need to Use Them in Your Small Business! and even specific life experiences. when it comes to a criminal past. Even when two people have been charged with the same crime, not all things are equal. Things like; were they arrested, but not convicted?, how long ago did the crime occur?, were there any relevant mitigating circumstances? Understanding these differences and accepting them is important ~ especially when it comes to hiring. In my view, these assessments are an inevitable extension of “Ban the Box”. They are an integral part of the movement to eliminate the immediate disqualification of ex-offenders from being hired. Individualized Assessments are used when the background check on your applicant uncovers a criminal past that may keep you from hiring them. And when this happens, there are specific steps you must follow to be compliant with EEOC guidelines. 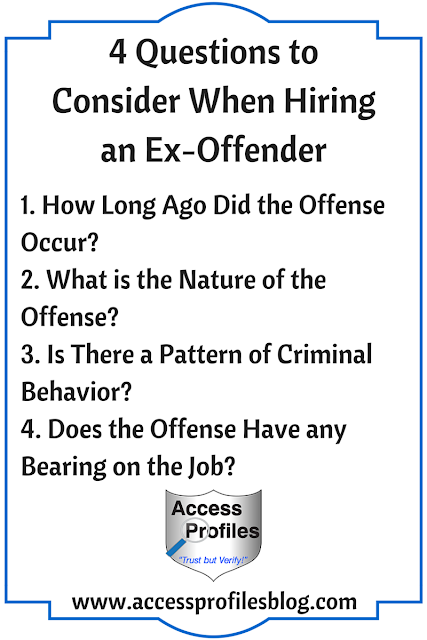 These steps involve informing your applicant, in writing, that they may not be hired due to their criminal history; giving them a chance to explain or mitigate your findings; and assessing the additional information provided before making a final hiring decision. The challenge for anyone involved in the hiring process ~ from human resource departments, to hiring managers, to company owners ~ is to use what you find out during these assessments correctly and fairly. In most cases, your hiring decision will rest on 2 factors ~ whether the mitigating information supplied by your applicant is relevant and whether their crimes have a direct bearing on their ability to do the job safely and effectively. When your applicant is given the chance to explain the circumstances of their criminal history, or to refute the background check findings, they are essentially being given the opportunity to state their case. Any proof that the background check information is incorrect. Any mitigating facts surrounding the offense(s). Any efforts at rehabilitation, education, or training since the offense. Any employment or character references. Any evidence of successful employment history pre and post conviction. If your applicant does not respond to your attempt to gain additional information on their criminal history, then you are within your rights to make your hiring decision without it. The time that has passed since the offense. Their age at the time of the offense. In addition, you should place your emphasis on offenses for which your applicant was convicted, not just arrested. The EEOC guidelines state the importance of considering convictions, not arrests, in your hiring decisions. In their estimation, arrests do not necessarily indicate guilt. Convictions, on the other hand, can be treated as evidence of guilt. Find out more about the importance of using Convictions, not Arrests, in your Hiring decisions, Here! However, even when only considering convictions, the EEOC still requires Individualized Assessments. This is why it is so important that you have sound policies in place to cover the use of Individualized Assessments in your hiring practices. Doing this well in advance of placing your “Help Wanted” sign is key. And any time you can put hiring policies in place to keep your company from the notice of the EEOC, it is a good thing! You can find additional tips to help you stay under the EEOC’s radar Here! Following these will ensure that You are complying with all aspects of the Individualized Assessment and document the steps taken during your decision-making process. I believe that doing Individualized Assessments is a good thing. They keep a strong balance between the rights of Your Company to hire safe and qualified employees, and the chance for ex-offenders to gain employment. without resulting in any excessive burdens on Your Company or Your Applicant! Remember ~ No two life stories are exactly alike. People are more than what is written on paper and they can grow and change. Bringing that view into your Hiring process makes sense. And this is where Individualized Assessments come in! Are You Ready to Use Individual Assessments in Your Small Business? Looking for more Tips & Information to help Your Small Business Navigate Hiring and Background Checks? Visit our Website to discover more About Us ! Let’s Connect! Visit our Contact page with links to our email and Social Sites!